Osteoarthritis of the Wrist Handout | Dr. Thomas Trumble, M.D. Who has SLAC or SNAC Wrist Pattern Arthritis? Although the injury may have occurred in earlier decades with a fracture of the scaphoid or a rupture of the ligament, the arthritis typically develops when individuals are in their 50s or 60s. There is pain, swelling, and stiffness of the wrist. The swelling oftentimes is diagnosed as a cyst or ganglion, but x-rays will reveal the underlying arthritis. Simply removing the cyst will not solve the problems, unless the arthritis is treated. How do we diagnose SLAC or SNAC Wrist Arthritis? These are best diagnosed with x-rays. 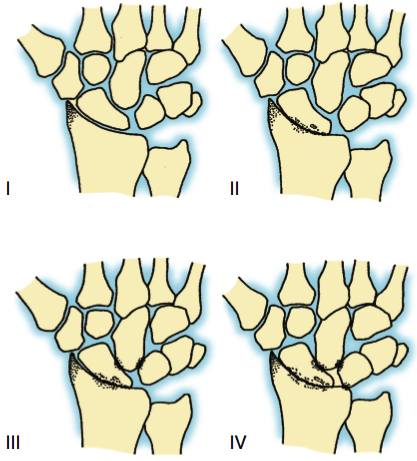 Those show the area of varying degeneration in the wrist. Occasionally computerized tomography (CT) scans can be helpful to obtain a three-dimensional picture to determine precisely, which joints to become involve in order to be able to treat the patient and still safe as much motion as possible for the wrist. How do we treat SLAC or SNAC Wrist Arthritis? 1. In mild cases with swelling and inflammation, an oral, nonsteroidal antiinflammatory (NSAIDs) medication can be helpful. In patients with more severe pain, corticosteroid injections can provide substantial relief, although these do not cure the problem, they can provide patients with months and occasionally years of relief. 2. Surgical treatment provides the most predictable long-term relief of SNAC or SLAC arthritis. When the arthritis is in the Stage I format, a simple excision of the wrist with the bone spurs impinging the patient, it can provide relief. This is known as a radial styloidectomy. 3. When the arthritis involves the area of the scaphoid, but the rest of the joint is spared, there are more options. In our experience, often times a simple excision of the scaphoid and repair of the joint capsule can provide relief. This is known as a scaphoidectomy and capsule repair. In this surgery, the scaphoid is removed, the capsules are repaired and patient is splinted for two weeks. Once the sutures are removed in two weeks, the splint is replaced with a removable brace and early therapy is started. No long-term casting or bracing is required and the patient is usually able to return to most activities within one month and regain maximum strength and motion in three months. Another option for the patients with stage II SLAC is to remove not only the scaphoid, but also the lunate and triquetrum (Figure 4). This is a proximal row carpectomy (PRC). The goal of this surgery is to allow the capitate (the large bone in the center of the wrist) to find a new joint surface with the radius instead of with the lunate, which has been removed. This operation does not require long-term casting or immobilization. If patients have early stages of arthritis involving the capitate, they can have a progression of the arthrosis and require additional treatment. 4. Once the middle of the carpus is involved with arthritis (SLAC or SNAC stage III, it is necessary to fuse that portion of the wrist joint. 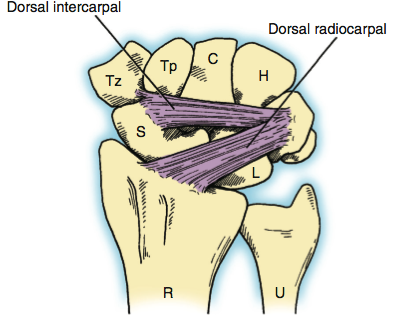 When combined with the scaphoid excision, this is termed a four-bone fusion. (Figure 5 and 6). These require casting or bracing for at least six weeks until the bone fusion or arthrodesis consolidates. At that point range of motion strengthening exercises is started, which can continue for approximately six weeks after surgery. Grip strength and range of motion improve for 3-6 months following the surgery. Occasionally, the plate or pins that are used for fusion need to be removed if they cause any irritation of the tissues. Key concerns for any of the above procedures include infection, stiffness, nerve or tendon injury and need for revision surgery. Most of these complications are quite rare. The major concern is for progression of the arthritis that would advance to stage IV arthritis. Stage IV, when the arthritis involves the entire wrist joint, the only viable option is to either fuse or replace the joint. In osteoarthritis for most patients, joint fusion is the most predictable (Figure 7). 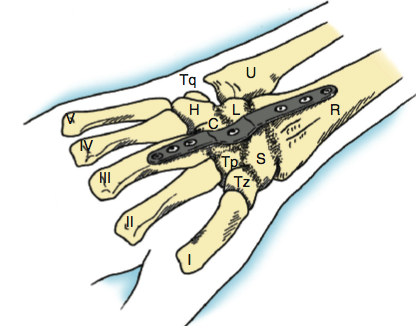 In this case a plate is placed from the radius across the wrist joint or carpus and on to the metacarpal in the hand. This allows the entire area to become consolidated to fuse this. Similar to other fusions, mobilization with splinting or casting of over six weeks after surgery is recommended. Then protective bracing with range of motion strengthening exercises are advanced. It may take 3-6 months for the patients to regain strength and range of motion, especially for rotation of the forearm. Once the wrist is fused, there is a permanent loss of wrist flexion and extension and ulnar deviation. Rotation of the forearm is preserved. 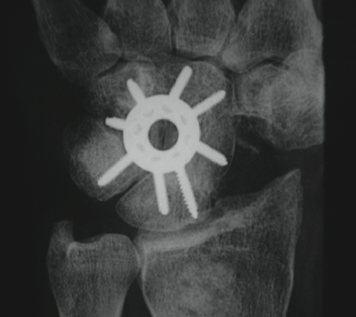 The key concerns for this procedure are similar to that for the other wrist fusion procedures. In most cases, the plate is removed in 1-2 years following the surgery because the firm strong plate fixation often causes some irritation of the skin during heavy use. This could be done as a simple outpatient procedure.